1857-02-02: Joaquin Bolado marries Julia Josepha Abrego. Monday, February 2, 1857, Joaquin Bolado marries Julia Josefa Abrego (b. 04-23-1843 Monterey), daughter of Don José Abrego (b. Mexico 1813) and Josefa Maria Casilda Aniceta Estrada (b. 04-04-1814 Presidio, Monterey). Pierce, Marjorie. "East of the Gabilans" Valley Publishers, c 1976 Library of Congress: 76-56566. ISBN: 0-913548-39-1., p. 123. Joaquin Bolado was in Zacatecas, Mexico from 1841-1849. Bolado and José G. Arques would later purchase the Santa Ana y Quien Sabe Rancho on Friday, November 2, 1866. Jose G. Arques born. 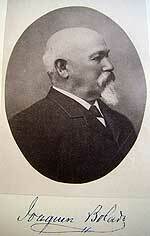 Also known as Joseph G. Arques of San Francisco. Friday, November 2, 1866, at age 27, he bought Rancho Santa Ana y Quien Sabe with co-owner with Joaquin Bolado. Juan Miguel Anzar, (who on December 29, 1838 would request the grant of Rancho Santa Ana with Manuel Larios) was granted Aromitas rancho (Las Aromitas y Agua Caliente). Source: Memorial and Biographical History, Coast Counties Central California. Lewis Publishing Co. Biographies, 1893. p. 437. Note: Frederick A. MacDougall, the Anzar guardian, ended up owning this in 1862.